Albert Einstein once said, “You have to learn the rules of the game. And then you have to play better than anyone else.” In the game of rodeo, there are many players. Many players, variables, situations and challenges that are constantly changing and re-defining the definition of one of the toughest sports in the world and one of the toughest sports in rodeo, team roping. A cat-and-mouse game, team roping is far more complex than what meets the eye. A world record holder and Professional Rodeo Cowboys Association (PRCA) champion, the goal at hand was to better his idol. 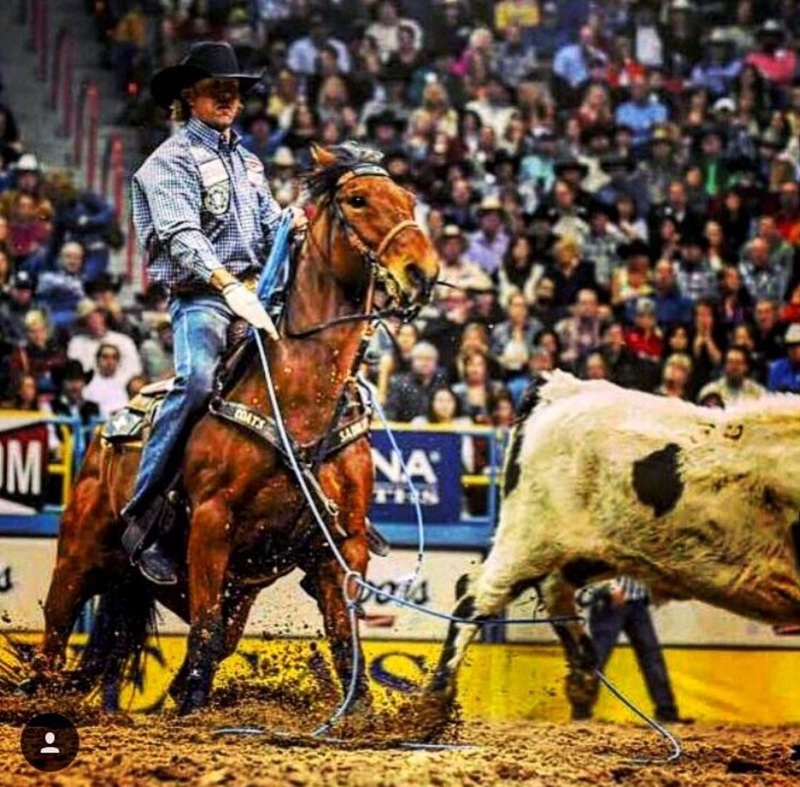 On August 5th, Derrick Begay and Clay O’Brien Cooper raised the roof at the Elite Rodeo Athletes (ERA) Salt Lake City, Utah rodeo with a rapid 3.42 seconds, a new ERA record. Clay Tryan and Jade Corkill faced each other as the clock stopped at 3.35 breaking the short lived ERA record by Begay and Cooper. This was among Tryan and Corkill’s fastest runs of their lustrous rodeo career. There is no doubt about it, Jade Corkill is a mastermind.No matter how high or low, you can guarantee under pressure, that the Nevada raised cowboy will perform extremely well, no matter the conditions. Although Corkill was born with a special gift and natural talent, his fame and fortune wasn’t and hasn’t been handed to him. Having a healthy mind to balance wins and loses is very challenging. Corkill has proved to the world time and time again that no matter what mistake he makes or shot he misses, motivation, dedication and determination stick with him to finish on top. As practice is a vital key in his success, he takes the definition of practicing to different levels. “Practicing to me is everything. It can’t be uncomfortable no matter what happens. So, the only way to make that happen is to practice and practice until you don’t even realize you’re practicing,” he states. Corkill is an inspiration and a clear image of a hardworking, genuine and down to earth athlete and cowboy. Full of life and love, he is inspired by anyone and everyone who fights the mental battle and puts forth the work and effort. His parents, Bruce and Mitzi Corkill are two individuals he holds deep admiration for. The Champ, Clay O’Brien Cooper, is not only his rodeo hero, but someone who has influenced him and helped him throughout his career. Clay Tryan, Clay Cooper, Leo Camarillo, Phil Lyne, Larry Mahan, Cody Ohl, Tuf Cooper and Trevor Brazile, all possess something special that have inspired Corkill throughout his years. This month, Tryan and Corkill will be holding two, 2-day roping schools in Stephenville, Texas. Prior to this, Corkill has produced three roping schools. As his career is slowing down, his aspirations are to produce more ropings and schools not only for adults of all levels, but kids. Giving back to others is something that Corkill believes in and in doing so, he hopes to help save people time by teaching and demonstrating techniques that can help all ropers. “I hope to have everyone walk away with a better understanding of how to play the game even more so than the physical roping. It’s all important but there are some things that you can do in your head that make it a lot easier. I also hope they feel like they truly got help and that they have fun while there,” Corkill says. California Rodeo Salinas is Corkill’s favorite rodeo. Not just because of the history, five steer average, old school set-up and relaxation, the strawberries in the cowboy hospitality are awful tasty! Corkill’s goals are to win the ERA’s team roping championship. After a devastating miss in the 5th go-round at the BFI, a few years ago, he anticipates to someday add a BFI victory to his list of accomplishments. With hard work and determination, there’s nothing that will stop him. The unbeatable Corkill has re-defined mastermind. From the practice pen to the arena, there is nothing that will hold Jade Corkill back. You can follow Corkill’s journey on his Facebook page: Jade Corkill Fan Page. Visit Caliidreamin.com for a Q & A interview.